If you cast your minds back to 1994, or allow yourself to simply imagine that time if you weren't born yet, you may remember Mickey Mania on the SNES. Developed by Traveller's Tales, this platformer also arrived on Sega Genesis and Sega CD, with one noteworthy element being its 3D, 'into-the-screen' chase - seemingly a first in game development at the time. So how was this achieved? Well, YouTube user GameHut - who just so happens to be Jon Burton, ex-director of Traveller's Tales/Tt Games, no less - has shared some insight into the process. The video goes into a nice level of detail, breaking down the individual elements on screen to show how the final gameplay was pieced together. Using a mixture of layering, repeated animations, and very cleverly shifting around a set of colour palettes, the final result was a huge success. Seeing each stage come together - especially the moving floor - is rather fascinating, and goes a long way to show how game developers were utilising the technologies available to them at the time. If you found yourself marvelling at the chase sequence back in the '90s, you can now rest easy knowing exactly how the magic happened. Do you have any memories of Mickey Mania? Would you have guessed how the sequence works under the hood? Feel free to let us know below. Gamehut's technical videos on their previous Traveller's Tales projects are great. Classic game development is absolutely fascinating! It’s crazy to think about all the tricks developers had to use to achieve a desired effect with such extreme limitations. Not only is the video clear, detailed and interesting but it gets straight to the damn point. No loud, extended intro, no waffling for the first 30 seconds etc. Love it. I've watched some of his videos. I love these insights to game making, especially since I'm a programmer myself. This particular video I've seen when it came out, though. As a developer myself, this is a jewel ! It could be a great idea to have that kind of content more often on NL. Thank you for the video guys. Impressive but I think the Lion King (by Virgin Interactive) does this better with the Stampede stage, a game that also came out same month and same year as Mickey Mania also released for Sega Genesis and Super NES. 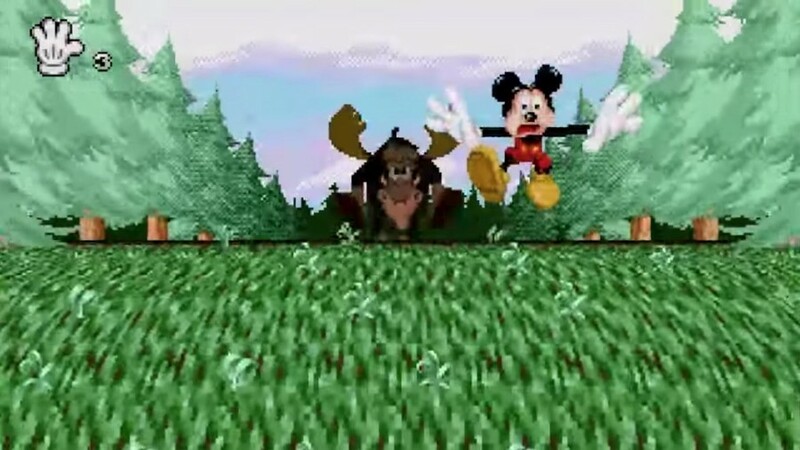 Mickey Mania only focus on the moose and Mickey, in the Lion King Simba, the rocks, canyon and the amazing zooming and scaling of the buffalos were more engaging and exciting plus you can see different expressions from the Simba sprite better than the one dimensional effort of Mickey in Mickey Mania. @retro_player_22 yeah I was going to check the launch date of The Lion King. Really enjoyed that game as a kid. Gamehut technical videos are fantastic. It was great to learn how things were done to pull off various impressive effects on limited hardware. I subscribed to the channel very quickly after finding it. I had this game on the SNES back in the day and a friend of mine had it on the Genesis. I only recently found out there was a PlayStation version of this game. I owned that game on the Super NES. A game which actually had loading times. And yes, these pseudo 3D sequences and character animations and sprites were quite impressive at the time. This was such a memorable stage... one of the best Mickey games I've ever played. I'd say that it's second only to The Great Circus Mystery because that one had co-op, which my friend I spent countless hours co-oping through that and the Power Rangers Movie (SNES) games. @retro_player_22 I agree, that one was done much better, but the game wasn't nearly as fun for me. I found many of the levels to be tedious and arbitrarily difficult at the time. Would be a great game to remaster Sony! !